Over the course of just a few short years, Modelcollect has demonstrated an "out-of-the-box" mentality, clearly willing to take the risk associated with bringing new subject matter to market. Products such as their V-1 rocket and ramp, P.1000 Ratte mega tank and others demonstrate their ability to create compelling replicas that are now sought after worldwide by historians, hobbyists, and collectors from all walks of life. The T-90 is a Russian third-generation main battle tank that is essentially a modernisation of the T-72B, incorporating many features of the T-80U (it was originally to be called the T-72BU, later renamed to T-90). Our Price: $29.99 Back Order! TOS-1 (Heavy Flame Thrower System) is a Soviet 220mm 30-barrel (original system, Ob.634 or TOS-1M) or 24-barrel (Ob.634B or TOS-1A) multiple rocket launcher and thermobaric weapon mounted on a T-72 tank chassis. 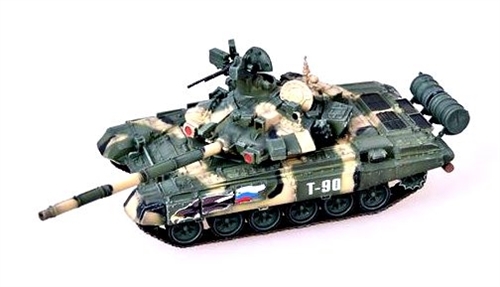 The T-80 is a third-generation main battle tank (MBT) designed and manufactured in the Soviet Union. A development of the T-64, it entered service in 1976 and was the first production tank to be equipped with a gas turbine engine for main propulsion. The Black Eagle tank (Object 640), was a presumed prototype main battle tank produced in the Russian Federation. It was thought to have been developed by the KBTM design bureau in Omsk in the late 1990s. A production version of this tank has never been publicly demonstrated. The BMP-1 is a Soviet amphibious tracked infantry fighting vehicle. BMP stands for Boyevaya Mashina Pekhoty 1, meaning "infantry fighting vehicle". The BMP-1 was the first mass-produced infantry fighting vehicle (IFV) of USSR. It was called the M-1967, BMP and BMP-76PB by NATO before its correct designation was known. The T-14 Armata (industrial designation "Object 148") is a new Russian main battle tank based on the Armata Universal Combat Platform. It was first seen in public (initially with its turret and cannon shrouded) during rehearsals for the 2015 Moscow Victory Day Parade. The Russian army plans to acquire 2,300 T-14s in the period 2015-2020.